Blending DJ and live band music at your next event? Here’s what you should know! More and more, DJs are becoming the go-to entertainment option for events. It makes perfect sense. We offer flexibility, playing precisely the music you and your guests want. We are often a more economical choice, offering event enhancements like lighting for reasonable (or event inclusive) prices. However, any DJ will readily admit that in some circumstances a band is precisely what’s needed. They bring excitement, personality and authenticity to an occasion. They can prime a crowd for a long night of dancing, add emotion to a ceremony and give a cocktail hour an extra level of sophistication. 1. Inform both your DJ and the band that the other will also be performing. Professional performers like to know all of the details about an event before the big day. So, it is imperative that both your DJ and band are aware that the other will also be performing. If you’re worried that you’ll hurt our feelings by bringing on another entertainer, don’t. Professional DJs and bands are used to working in all sorts of circumstances and we always appreciate it when our clients give us the knowledge we need to be prepared. 2. Ensure your DJ and the band know exactly when “they’re on”. In addition to being aware that the other is onsite, it is also important to advise your DJ and event band when exactly they will be required to perform. It gives everyone involved ample time for set-up and ensures everyone has just the right amount of material prepared. 3. Inquire about whether your DJ and the band can coordinate equipment. 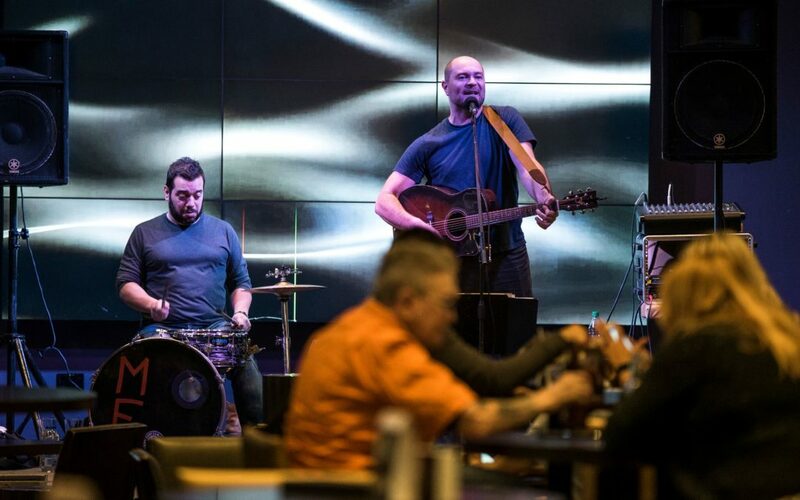 Even with our slim and stylish DJ tables and even if you hired “just” an acoustic musical duo, there’s no question that performers come with plenty of equipment. To ensure that our gear doesn’t interfere with the ambiance (or square footage) of your event venue, inquire with your DJ and band as to whether or not they can use some of the same equipment. Speakers and lighting are perfect examples of equipment that can be used by both performers. Are you searching for the perfect musical accompaniment to your event and DJ entertainment? Ask us! We’ve worked with many live bands over the years (like Matt & Frankie) and would be happy to make the connection.